Centro Hispano executive director Edel Segovia ’12 Ed.D. is the recipient of this year’s Kathleen Berkeley Inconvenient Woman Award for her commitment to issues of social justice. 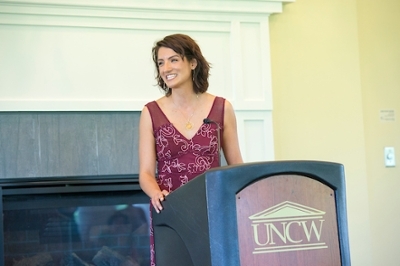 The Inconvenient Woman Award recognizes a UNCW faculty or staff member for activism on the behalf of others. Segovia was presented the award during the Purple and Lavender Reception on May 3. Segovia’s philosophy is rooted in her experience as an immigrant to the U.S. from Peru, and in her family’s value in education, she said. 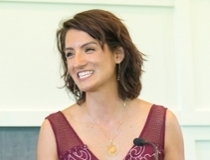 The Kathleen Berkeley Inconvenient Woman Award is given annually by the Women’s Studies and Resource Center in honor of Berkeley’s work as a courageous advocate for marginalized members of the UNCW community. Berkeley retired from UNCW after serving 34 years as a history professor and associate dean of the College of Arts and Sciences. Previous recipients are Berkeley (2015); Michelle Scatton-Tessier, associate dean, College of Arts and Sciences and associate professor of French (2016); and Candace Thompson, associate professor in the Department of Instructional Technology, Foundations and Secondary Education (2017).